Now that's what I call humour. They don't make them like that anymore. His pater is very rich and have a super Rolls enuf said. At Prep school I won the annual Latin prize. Prize - a book of your choice. 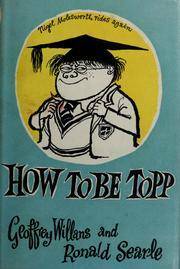 The headmaster was almost disconsolate when I asked for "The Complete Molesworth" - but bless him, got it for me. Extraordinary body of work, Searle. St. Trinians quite magnificent of course, and exquisitely translated to the big screen. Mind you, Alastair Sim along with Tommy Cooper can still make me laugh without uttering a word, and Joyce Grenfell bless her I just adore. I don't know - but it'sw very good. And indeed CH was a huge smoker at school, that I do recall!